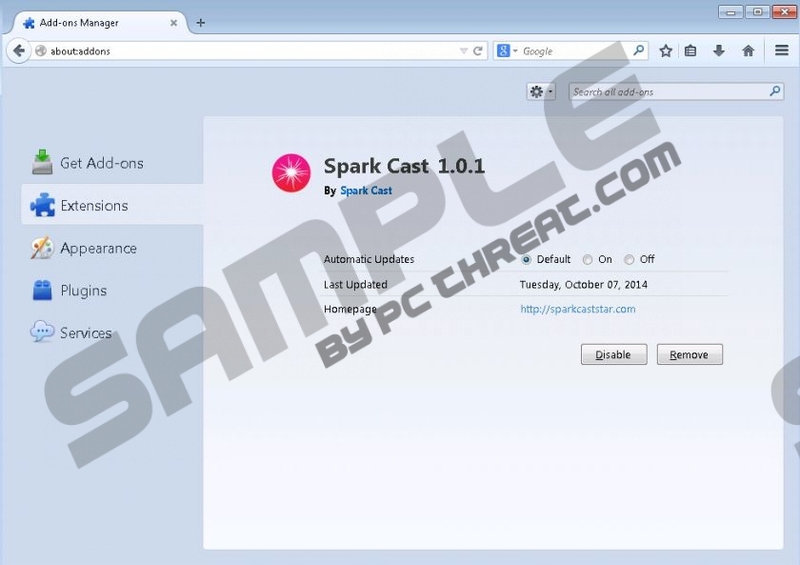 If you cannot browse the Internet properly because of all the annoying pop-ups that appear on your screen, better check whether you have Spark Cast installed on your PC or not. It is an adware application that generates a flow of commercial ads in order to make easy money. Spark Cast does not steal your personal information, and it does not do anything malicious or illegal itself. However, having an adware programs on your system may eventually result in severe computer security issues, so it would be for the best to remove Spark Cast right now. Some users say that they do not remember installing Spark Cast on their computers. It might be true because Spark Cast does not come directly from its main website. You can only read some basic information about it at sparkcaststar.com, but the direct download link is dead. Consequently, the only way Spark Cast can enter your system is through bundled downloads. That is why you may not know that this adware application is about to get installed on your PC – you most probably are too focused on the main application you have downloaded. However, each time you download a program at a third-party file sharing website, be aware of the fact that freeware apps often are bundled with additional software. That surely does not surprise us because Spark Cast is part of a big adware family called SuperWeb. The SuperWeb family is full of identical adware applications, such as Platamoose, AdvanceElite or Rad Rater. Although their names are rather different, these programs exhibit the same behavior. They enter target system bundled with freeware, and when user intimates the installation Spark Cast and other similar apps adds extensions to your default browsers. Luckily, the newest Google Chrome versions block this application, but even if it does not manifest on your browser, it still remains on your system. For the most part, Spark Cast is more annoying than dangerous because it floods you with commercial advertisements when you access such websites like eBay, BestBuy or Amazon. It may seem that it tries to help you find the best deals for the lowest prices possible, but in reality Spark Cast does not even review what kind of links get embedded into the ads. Thus, it presents particular security concerns that should not be overlooked. If you are a computer security-minded user, you will uninstall Spark Cast from your computer today. It is easy to remove the application via Control Panel. To check for other unwanted programs, you can always can the PC with SpyHunter free scanner. Do everything it takes to protect your PC from harm, and do not hesitate to invest in a licensed antispyware tool if need be. Open Uninstall a program and remove Spark Cast. Go to Uninstall a program and remove Spark Cast. Select Add or remove programs and uninstall Spark Cast. Quick & tested solution for Spark Cast removal.